Do you know what April is? Aside from being the pointless month that you wish would just end so that May can be here and snow will be gone for good. April is National Poetry Month. Who knew? Certainly not me. And here the month is already more than half over. Those poets have a sense of humor. I also love under their FAQ’s where they answer the question, Does it cost anything to participate in National Poetry Month? Do people really ask that question? For those of you reading here who are wondering the very same thing, it costs $100 if you want to read any poetry this month. Please send your checks to me. Or paypal me. Either one would be fine. They also have a feature at their website where you can sign up to have a different poem emailed to you every day for the month. Or you can browse through the previous two and half weeks of daily poems at their site. So while I already missed out on half the month, yesterday I pulled out some of the poetry anthologies we own and set them up for the children to look at. You know how when you go to the library the librarian has helpfully pulled interesting books out of the shelves and set them standing up on top of the bookcases? Well, I do that too. And you know what? The children really do gravitate toward those books. Because apparently looking through the bookshelves is very difficult. And if you think that is cute, I am willing to lend him out. This entry was posted on Tuesday, April 17th, 2007 at 8:05 pm	and is filed under Uncategorized. You can follow any responses to this entry through the RSS 2.0 feed. You can leave a response, or trackback from your own site. I think it’s cute, but I’ve got my own book wrecker over here. The postion has already been filled. I love that you set books on top like that. Great idea. Can we see the whole bookcase? Because I need to copy it. It looks like a fantastic reading spot you’ve got there. I need to copy that too. No, I’m not a weirdo stalkery person. And the books on the top is a great idea. Can we see the whole bookcase? Because I need to copy it. It looks like a fantastic reading spot you’ve got there. I need to copy that too! And the books on the top is a great idea. whoops! apologies for the reprint. we take almost all the books the librarians set out, so we did know about national poetry month. my girls love poetry. We do a lot of haiku for homeschooling. 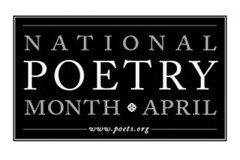 Former English prof/geek that I am, I did know that it was National Poetry Month. However, current stay-at-home parent/bad mother that I am, it completely escaped me to include my three-year-old daughter in the poetry celebration. Maybe I’ll read some Sylvia Plath to her later. But what I really wanted to say is that I love (read: covet) your bookcase. I must know if this was a custom-built piece or if I can purchase it somewhere–and if so, where? 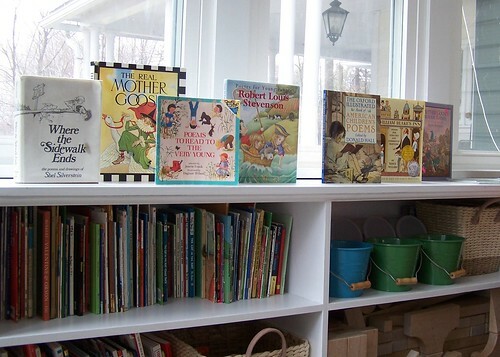 When I redid the kids’ playroom, I made them a “reading corner”–a little couch of sorts with lots of cushions and a reading light above, sectioned off from the rest of the room by bookshelves. It is, hands down, the kids’ favourite part of the room. I had that Mother Goose Nursery Rhymes book with the checkered cover when I was a kid and loved it. Alas, it was ruined with all of our other wonderful children’s books when a sewage pipe burst in my parents’ cellar. I looked everywhere for that version for my own kids but never did find it. I have one of the later editions, the cover is a little different (purple) and, if I’m not mistaken, there aren’t as many of the wonderful drawings inside. Is yours from your own childhood or are the older-styled ones still out there somewhere? You have such nice librarian’s! Our children’s section is so small the librarian and one adult can’t even fit in it! Off to research some preschool appropriate poem books! I think it is adorable! I’ll take him!!! Oh, that is cute, I’ll borrow him! I miss that age… I should do that with the books, so we spend less time with 8000 books pulled off the shelves and piled on the floor while searching for that one particular one. I used to read my son poetry (grown-up poetry) when I was pregnant, and then I put him to sleep with it when he was a baby. Now he gets bored with it because there are no pictures and no storyline to follow, but I hate most kids’ poetry because I’m pretentious like that. Thanks for the info—I’ll introduce more poetry into my preK classroom this week!! We LOVE poetry here! One of our favorites when the kids were younger (well, still our favorite now that they’re older) is A.A. Milne. We’ve memorized several of his poems. We also love Robert Frost and Sara Teasdale.